Elephants parade down a Chattanooga street before P.T. Barnum's traveling circus performance. Updated at 9:18 p.m. on Saturday, Jan. 27, 2018 to correct information about W.C. Gardenhire. "We Have Seen It" was the caption for the Dec. 2, 1872, Chattanooga Daily Herald article on the Greatest Show on Earth. P.T. Barnum, the "Prince of Humbugs," brought entertainment and education to town in his Great Traveling Museum, Menagerie, Caravan, Hippodrome and Zoological Garden. Barnum first showcased his menageries and oddities in his American Museum in lower Manhattan, New York City. Its attractions made it a combination zoo, museum, lecture hall, wax museum, theater and freak show and included a flea circus, a rifle range, glass blowers, an oyster bar, pretty-baby contests, a 25-inch Tom Thumb, and Shakespearean drama. After the museum burned in 1865, William Cameron Coup, a Wisconsin businessman, supported him in touring the country with "P.T. Barnum's Grand Traveling Museum, Menagerie, Caravan, & Hippodrome." His circus train took its acts and animals to those who until then could only read about such things. Barnum brought his circus to Chattanooga on Nov. 30, 1872, just a few years after the end of the Civil War. His ad began on Nov. 19 and ran until the show date, taking up a third of the Daily Herald's front page. Barnum promised more than 100,000 living and representative curiosities. To see the show cost an adult $1 and a child 50 cents — or nothing if you bought his autobiography, "The Life of P. T. Barnum," for $2.25. Regardless of how you paid, the Herald reported a show at which "you got the full value of your money." If you couldn't pay the price of admission or buy the book, you could enjoy the unloading and loading of the railroad cars. Barnum was one of the first circus owners to transport his circus by rail and was probably one of the first to own his own train. 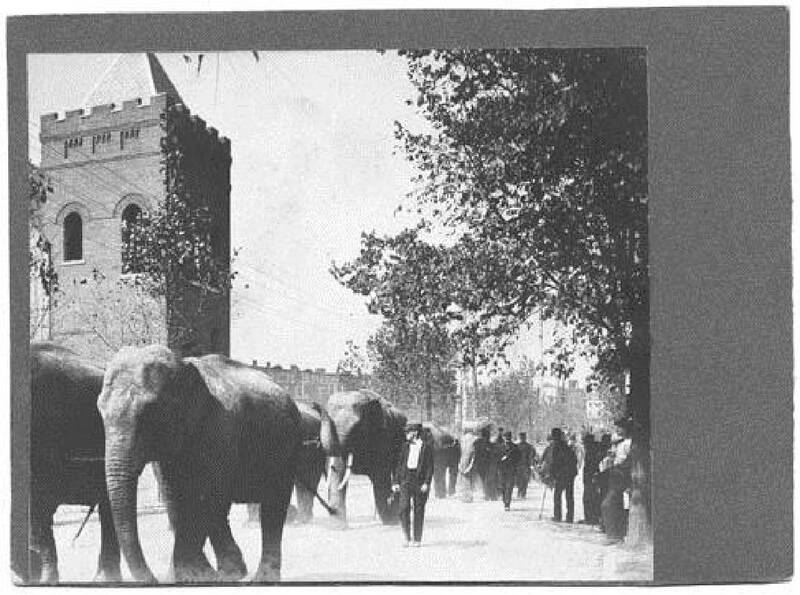 Once unloaded, the animals and circus wagons joined in a parade, whetting the appetite of the town folk for the coming show. What did Chattanoogans see in the six colossal tents? For mechanical marvels, you could gaze at the Bell Ringers, the Sleeping and Breathing Beauty, and the Dying Zouave, the most life-like automaton figures you would ever see. There were numerous wax figures of well-known personages. In the animal exhibits, you could view rhinoceroses, camels, an elephant and a white polar bear as well as the equestrian goat, the performing bear and the miniature horses in the arena. In the aquarium tent, land lubbers gawked at a living sea cow (manatee), sea lions and seals. The grand tent with its great double ring seated 12,000 visitors. Its 5,000 gas jets illuminated more than 100 performers and animals executing feats that formed the "most brilliant and dazzling spectacle that we have ever seen or ever expect to see again." A man and his wife pedaled a one-wheel velocipede, the forerunner of today's bicycle. Other circuses besides several more Barnums later came to Chattanooga, including Van Amburg & Co. in 1878. Cole's Circus came with a great electric light show in 1879. Coup's Circus gave a splendid street parade in 1881. That same year Barnum merged with James Bailey to become "Barnum & Bailey's Greatest Show on Earth." P.T. Barnum died in 1906, and the Ringling Brothers purchased his production, eventually merging the two in 1919 to create the Ringling Brothers and Barnum & Bailey Greatest Show on Earth. The show closed in 2017, never more to bring elephants, tigers and clowns to towns across America. None of the circuses that later came to Chattanooga matched the dizzying vision of P.T. Barnum. Circus trains and parades are gone but the memory of "Greatest Show on Earth" lives on. Suzette Raney is the archivist of the Chattanooga Public Library. To read more about Chattanooga and circuses, go to the public library or call 643-7725. Also visit Chatta historicalassoc.org. CORRECTION: Last Sunday's Local History column should have stated the Battle of Tunnel Hill occurred in Tennessee. The Times Free Press regrets the editing error.